DETROIT — Dwane Casey lost his job in Toronto because the Raptors wanted to advance further in the playoffs. In Detroit, it would be an accomplishment if Casey can simply get the Pistons into the playoffs. The Pistons hired the NBA coach of the year finalist Monday, hoping he can help the three-time NBA championship franchise regularly reach the postseason and eventually compete again for titles. 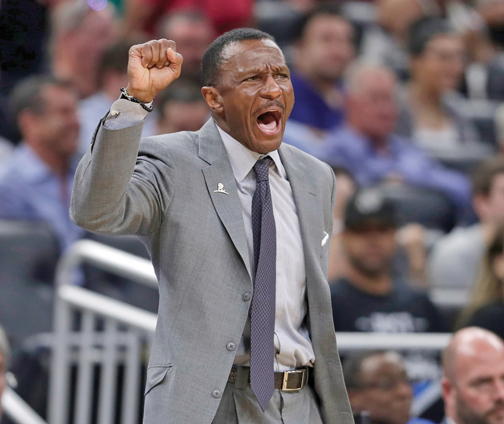 A month after being fired by the Raptors, Casey agreed to a five-year deal to become head coach of the Pistons, two people familiar with the situation told The Associated Press on Monday. The people spoke on condition of anonymity because the team had not announced the move, which was first reported by ESPN. Casey led Toronto to a team-record 59 wins this year and helped the franchise earn the top seed in the Eastern Conference for the first time, a performance that won him coach of the year honors from his peers at the National Basketball Coaches Association. He had one year remaining on a three-year, $18 million extension when he was fired shortly after Toronto was swept by the Cleveland Cavaliers. He was 320-238 in seven seasons and is Toronto’s winningest coach. The Pistons said Casey has already started work, including meetings with players, and will be introduced at a news conference next week. Detroit had been looking for a coach for more than month since firing Stan Van Gundy, who was also its president of basketball operations. Michigan coach John Beilein was a finalist for the job before withdrawing his name from consideration last week and San Antonio Spurs assistant Ime Udoka also was a candidate. Casey certainly has work to do. The Pistons have made the playoffs only once in nine years after advancing at least to the Eastern Conference finals six straight years, winning the 2004 NBA title and falling a victory short of repeating as champions in 2005. They do not appear to have much flexibility to make significant changes this offseason. Detroit acquired Blake Griffin in a blockbuster trade this past season and that wasn’t enough to push Detroit into the playoffs. An injury to point guard Reggie Jackson derailed what looked like a promising season.